Thank you for your interest in A ʽNʼ B Home Inspections. Our mission is to provide comprehensive information about the current condition of the systems and components of a home, to ensure our clients are not harmed financially or physically after the purchase of a home. A ʽNʼ B Home Inspections has been providing comprehensive home inspection services to the valley and surrounding areas since 1998. 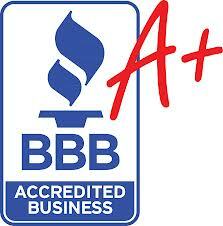 A ʽNʼ B Home Inspections is a proud member of the Central Arizona Better Business Bureau with an A+ rating. A'N'B Home inspections prides itself on providing the highest quality inspection service in the industry. All home inspections meet or exceed the standards established by ASHI, and adopted by the Arizona Board of Technical Registration for Certified Home Inspectors. In addition, we go above and beyond what the state requires, to deliver the most comprehensive inspection report possible. A'N'B utilizes forward looking INFRARED technology to provide details a normal inspection misses. With every home inspection we include a FREE, INFRARED scan of the exterior walls to verify proper insulation. If our cameras identify any potential gaps in insulation we will provide you with a FLIR report complete with photos and temperature measurements, in addition to the home inspection report. We will also electronically test all windows to verify the " Low 'E' " coating is present and installed on the proper side of the glass. Once the inspection has been completed we guarantee your inspection report with in 24 hours via email, most times same day. Our inspection report is an easy to read combination checklist and narrative style report with digital photos. A summary page is provided at the end of the report for a quick reference of the items that need to be addressed. Prior to the delivery of the inspection report the state of Arizona requires we have a signed inspection agreement. A ʽNʼ B Home Inspections is owned and operated by Erik Diener. Erik is dedicated to ensuring you will not be harmed financially or physically by your home purchase. He has inspected thousands of homes in the Phoenix and surrounding areas for both the purchase of an existing house, as well as one year new home warranty work. As a former firefighter he as extensive knowledge of building construction, materials, and safety hazards. 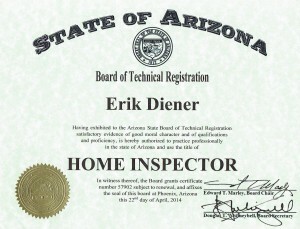 Erik is a fully insured state licensed home inspector with the highest standards of ethics and professionalism. • Fully insured; General liability and E&O with no claims filed. • Other Arizona areas by request. Trip Charges may apply.